Description: Erect annual glabrous herb with slender stems. Leaves few, narrow-ovate to linear-lanceolate, 5–12 mm long, 1.5–2.5 mm wide. 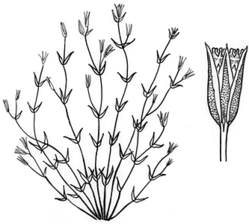 Cymes 1–3-flowered; pedicels 10–50 mm long. Sepals lanceolate, 4.5–7 mm long, with wide scarious margins. Petals entire, two-thirds as long as the sepals, white. Capsule ovoid, as long as the sepals; seeds numerous, minute, tuberculate. Distribution and occurrence: Weed of moist sites in gardens, pastures and woodland. Native of Eur.